The students of International Performance Research (MA) write about their experiences during Moving in November festival for Liikekieli.com. Last Melanie Jame Walsh on Cheap Lecture and The Cow Piece by Jonathan Burrows and Matteo Fargion. The Cheap Lecture of Cheap Lecture and the Cow Piece reminded me of an unlikely incarnation of Bob Dylan’s famous D.A. Pennebaker directed film clip for Subterranean Homesick Blues. Perhaps you know the one? It’s been borrowed time and time again since it’s release in 1965 by everyone from Australian 80’s stadium pop icons INXS to, much more recently, Minnesota rapper MaLLy. 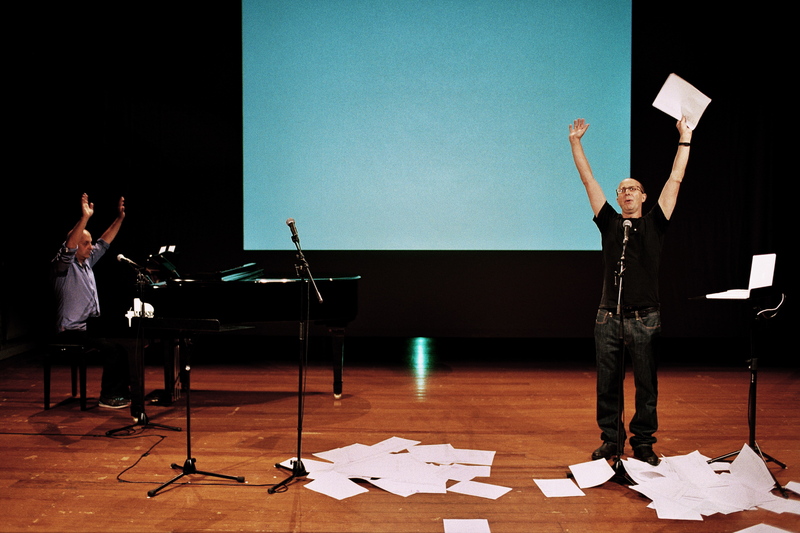 The basic premise is the use of cue cards that are shown to the audience as a rapid fire delivery of a vocal performance takes place. The cue cards carry words or phrases from the text as a kind of signposting of significance as the rhythm speeds you on by. Jonathan Burrows and Matteo Fargion offer up what is possibly the most unhip guise of this particular trope thus seen and yet, I adore them, their cheap lecture, and their cow piece. The stage of the Kiasma theatre is adorned unceremoniously with two tables infront of white screen. On on each table a small herd of 8 plastic cows and a note book. Downstage there are two microphones, besides one of these a low lecturn with an open macbook. Also on stage are a piano, a mandolin, a harmonium, an accordian and can of soft drink. Into this scene enter two men with an equal lack of ceremony. They are unceremoniously white and middle aged. Both are quietly balding. Both are subtly sporting gold wedding rings. One wears glasses. Both speak with unassuming British accents. They are wacky middle class dads. They are the furthest from cool that one could hope to be. Standing in this fact, working it, in fact, Burrows and Fargion speak and rhyme in flow with one another with words that stream, solo and in tandem. These words are read from reams and reams of white A4 paper which fly discarded into a pile on the floor at their feet. Different phrases from these words appear projected on the screen behind them in said Dylan/Pennebaker style. A phrase repeated, along with so many wonderful things, as Satie-like compositions are cued in and out from the stage. The whole piece, this Cheap Lecture, is about rhythm and flow. It touches self-reflexively on so many profound and wonderful things (from the experience of performing itself to those hoary old chestnuts: difference and repetition) whilst simultaneously engaging in the best of British absurdism. I am charmed. The whole room is glowing warm with delighted laughter. The premise of Cheap Lecture is structured as response to, and borrowing of, John Cage’s Lecture on Nothing. Cage’s beaming face appears for a time on the screen. There are also echoes of Glass’s Einstein on the Beach. Counting. Lot’s of counting. Jonathan Burrows was a dancer with the Royal Ballet for 12 years. Fargion has a long career as a composer. The two have worked together for nigh on 20 years. Between them onstage is that unique tenderness of long term collaborators. Their own backgrounds, and the milleu from which they borrow, reveals them as a very British answer to the question, ’What became of the other postmodernists?’. Cow Piece runs directly after Cheap Lecture. This time the cows are involved and the tandem scores are written in two exercise books. As I watch, I wonder if they write a score for each other before the performance, drawing on an established vocabulary of absurdly strung together actions, sounds, instrumental phrases and objects. While the piece is wildly ridiculous, in a very Pythonesque tradition, it also makes light of the morbidity of senselessness, and the senselessness of our mortality. At several points, Burrows treats us to some suitbably dorky contemporary dance, Fargion some machine gun mandolin. What is most striking of all is that the thing that makes Cheap Lecture and the Cow Piece really impress is the willingness and comfort of these two magical friends to sit in the absurd and the ridiculous. Their authenticity, their chops as performers, make these two dads…the coolest. The Cow Piece was co-produced by Kaaitheater Burssels and supported by the Flemish Ministry of Culture. Premiere 2010. Read also Olivia Furber’s review and Maria Prokhorova’s experience of the same performance.